Sound "Vocal performance is excellent, with just the right balance achieved -- neither chesty nor thin"; highs are smooth, but "perhaps the last gasp of air could be considered missing"; "musically satisfying bass depth and weight with a great sense of articulation." Features Trickle-down design technology from B&W's original Nautilus project and drivers from the more expensive Nautilus 801 speakers. Use David found that bi-wiring aided in the 804's "fabulous driver integration"; have the "ability to reveal what's going on upstream," so choose partnering equipment wisely. 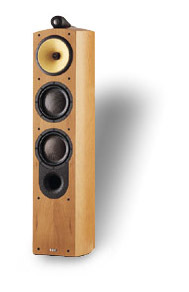 Value Floorstanding speakers that offer much of the technology (and presumably sound) that make up the more expensive Nautilus models, but at a lower price. My first exposure to B&Ws flagship Nautilus range of speakers was at the 1999 Toronto audio show. Prior to that I had only seen pictures of the revised Nautilus 801 and 802. Well, by the time the show came around, the lineup had sprouted some smaller siblings, namely the Nautilus 803 and the subject of this review, the Nautilus 804. Although it was impossible to get any feeling for what the speakers in pictures might be capable of sonically, their striking appearance definitely grabbed my attention, and I thought that they were something that I had to follow up on. So when I was asked to write a review of the Nautilus 804s, my first for SoundStage!, I jumped at the chance. Prior to this, my exposure to B&W products had been -- um, how shall we say -- less than an affair of the heart. I always found B&W speakers rather dry-sounding, the exception being the 801 in its various lives. Were the Nautilus 804s the B&W speakers that would change everything for me? Read on. The $3500-per-pair Nautilus 804 is the smallest floorstanding speaker in the Nautilus 800 range, the review samples being finished in a wonderful natural cherry stain. Black-ash as well as a dark-cherry stains are also available at no extra cost. A lot of the information gained from the research on the original Nautilus project was so revealing into the nature of driver technology that it was only a matter of time before some of that ideology filtered into some of B&Ws other products. Hence the entire reworking of the 800 series to include some of the Nautilus technology. That original pricey Nautilus speaker was unique in that it had no standard cabinet to speak of; rather it relied on tapered tubes to house the drivers. Although its nearly the same tweeter (the Nautilus 801/802 tweeter uses edgewound wire on the voice coil, and the tweeter housing is made of cast aluminum), the Nautilus 804's high-frequency driver doesnt share the Nautilus 801s lacquered finish on the "tube." The graceful shape of the tube is said to aid in controlling and channeling the back energy from the driver. I almost have to laugh, though, as it kind of reminds me of a turkey baster that's been glued on to the top of the cabinet. The tweeter tube is isolated from the main cabinet by a layer of Raychems Isogel to help damp vibration artifacts. The midrange driver is borrowed from the Nautilus 801 and is the same driver used in the entire Nautilus 800 range, although implementation is somewhat different in that it doesnt share the 801s (or 802s for that matter) molded Marlan head to house the driver. The driver is B&Ws yellow Kevlar FST (Fixed Suspension Transducer). The midrange mounting is unique in that it is fixed to the cabinet by means of a bracing rod fastened to the back of the magnet assembly, hence the locking assembly protruding from the back of the cabinet. Below the midrange are two 6.5" Kevlar/paper woofers, loaded in a reflex configuration with a flared port sporting dimples on the surface, which are said to aid in reducing turbulence at the mouth of the port -- or as the British like to refer to it, "chuffing." The overall cabinet height is approximately 40", the width is a narrow 9.5", and depth a little over 13". Crossover points are specified as being at 350Hz from bass to midrange and 4kHz from midrange to tweeter. Specified frequency response is from 45Hz-20kHz +/- 2dB on the reference axis. A sensitivity of 89dB/W/m is quoted. However, the impedance reportedly dips down to the 3-ohm range, so an amplifier capable of providing a healthy amount of current and control would probably be best for the Nautilus 804s. Connections are on the back of the cabinet near the bottom via a pair of WBT binding posts, which are configured to accept either spades or banana plugs. Jumper cables are provided in case the speakers are to be single wired -- something I wouldnt recommend for reasons I will get to shortly. Spikes are provided, which screw into the bottom of the cabinet, and they are of average quality; however, Sound Anchors makes some very cool dedicated stands specifically for the entire Nautilus range, and these may be well worth investigating. Each cabinet tips the scale at 53 pounds, making the speakers fairly easy for one person to move around (no back belts required for these babies!). A good portion of that weight is due to the extensive bracing within the cabinet, the latest incarnation of B&Ws Matrix enclosure, which attempts to transform the cavity into more of a solid body, thus allowing the drivers to perform less impeded by the box itself. Ye old knuckle-rap test yields a good solid sound across the surface of the enclosure, indicating that to a large measure the cabinet is of uniform rigidity. Aesthetically the Nautilus 804s are first-rate, possessing excellent finish and matching of veneer. The graceful contours that make up the rounded, almost ovular cabinet have been a refreshing change to have in my room for the last few months. A couple of friends have commented on how "almost organic" or "sensual" the speakers appear. The Nautilus 804s were listened to largely in my system based around a Sonic Frontiers SFT-1 transport driving an Aragon D2A Mk 2 D/A converter, into an Aragon Aurum preamp, which feeds a Krell KSA-200S amp. I used an MIT Digital Reference from transport to DAC, Transparent Ultra interconnect from DAC to preamp, and Transparent Balanced Music Link Plus interconnect from preamp to power amp. Speaker cables are Transparent Music Wave Super bi-wire. A Mark Levinson No.31 CD transport, No.360 DAC, and a No.380 preamp also spent time doing honors in my system. Power was fed from an Audio Prism Foundation 2 for the source components, and power cords were Transparent Power Link Supers. These cords also spent time on the end of a Blue Circle BC21 and BC22 preamp/power amp combo wired with Blue Circle interconnects (follow-up review in progress). Placement proved to be very little trouble to bring out the 804s' finer points. They did benefit from being clear of room boundaries, and I ended up with the speakers approximately three feet from the back wall and two feet from the side walls. Break-in time was unusually long, however; a couple hundred hours were needed to get the speakers to sound their best. Before this the speakers sounded a bit too tightly wound; beyond, the midrange opened up, and the bass had greater authority and depth. I should also point out that all critical listening was done without the grilles; this is even suggested in the manual, and I would agree wholeheartedly as noticeable gains were made in midrange transparency and image focus with the grilles removed. The Nautilus 804s have proven to be somewhat of a revelation to me. Prior to these speakers arriving, I had been accustomed to the sound of MartinLogan Aerius i speakers (more on these later), and going from panel speakers back to box speakers can be rather challenging -- some would even say impossible. Usually the "sound" of the box becomes very apparent after being exposed to the coherence and transparency associated with well-executed ESL systems. But I had very little trouble getting used to the elegant Nautilus 804 speakers, their blend of virtues being easy indulgence. First, the Nautilus 804 can be breathtaking in its ability to capture the essence of the performance. Can be? Make no mistake, for better or worse the 804s' ability to reveal what's going on upstream can be a bit unnerving. A change of cable or a component swap immediately reveals a new sonic landscape. For example, listening to "Take her to Sea, Mr. Murdoch" from the Titanic Soundtrack [Sony Classical SK63213] with the Sonic Frontiers transport and Aragon preamp presented a large dynamic portrait, with a slightly forward presentation. Playing the same track with the Levinson No.31 transport and No.380 preamp (same Aragon DAC and cables) revealed the true beauty of the 804s abilities. The presentation became lush, the soundstage wide and naturally deep, as if the orchestra were well placed at the end of my room. So how do they handle voice and all that other good stuff? Vocal performance is excellent, with just the right balance achieved -- neither chesty nor thin. My audiophile, worked-to-death Diana Krall and Patricia Barber discs never sounded better. On listening to Carol Welsmans InClined [Justin Time JTR 8478-2], I discerned that the title track features a great bit of interplay between Welsman and the bass guitar. Both emerge cleanly from within their own respective ambient spaces -- very cool! Soundstage depth and width were well presented, with voices hanging well in a nicely defined space. OK, so the Nautilus 804s reveal cable and component changes and make Diana Krall sound great. But perhaps the most important attribute of the speakers is their driver integration. It sometimes became difficult to determine the various parts of the audio frequency due to the smoothness of transition from top to bottom. I think that bi-wiring is more or less mandatory for these speakers; I found that single wiring sacrificed some of the fabulous driver integration. When a speaker system sounds this coherent, it tends to be easy to forget the fact that you are listening to a number of drivers working together to present the music. This happened several times when I would sit down for a critical listen, and I simply drifted off into the music, forgetting to take notes on paper, or even make mental notes. What about that funny-looking turkey-baster thing sitting on top of the box? Oh that. I think its supposed to be the tweeter. The highs produced by the Nautilus 804 are very smooth. I think if you hear "tizz" or "sizzle" from the speakers, then have a look at the rest of the system because something has to be wrong somewhere upstream. In ultimate terms, perhaps the last gasp of air could be considered missing from the Nautilus 804s, but if thats the price to be paid for the smoothness, sign me up. I dont discern that the highs are unnaturally soft or forgiving, but I do believe that B&W has a winner with this tweeter in that it seems to tread the fine line between reticence and ruthlessness. An interesting point is that in redesigning most of the current range of speakers, B&W are opting to add this tweeter to each model -- albeit minus the special Nautilus tube. Ah the joys of trickle-down technology. More music. Playing the excellent Four of a Kind CD, For the Time Being (van den Hul VDH99CR01), the title track is simply a piano set back on stage left with a solo sax taking stage right. The piano was wonderfully lucid over the 804s, while the up-front quality of the sax was revealed with enough bite, but not to the point of being obnoxious. I also listened to Robert Michaels' Utopia [WEA 2 24552], and "Playa Del Sol" revealed fine detailing from the castanets, blocks and other rhythm instruments. This whole disc proved to be a joy in revealing some of the things that the Nautilus 804s do so right -- the organic wholeness of the guitar, taut skins of the drums, the timing interplay of the various rhythm instruments, and the articulate bass lines. Finally we get to the bottom of things. The bass produced by the Nautilus 804s is wholly satisfying -- and occasionally surprising. Let me tell you those two woofers can dig deep when required, while my Krell amp supplied all the necessary power to really open the speakers up when needed. Switching to the Blue Circle BC22 amp revealed the speakers to be a fine match with this 100Wpc amp, delivering a fine amount of control and extension. The aforementioned Titanic Soundtrack provided lots of ammunition to stretch the abilities of the bass, and at one point I recall my jaw dropping open, not expecting such power from the speakers. I live in a rather modest condo, and my main listening room is 11" wide by 23" long (typical living/dining combo). So I value the fact that B&W has given this speaker the attribute of providing musically satisfying bass depth and weight with a great sense of articulation. I would imagine that if your room were much larger than mine, the Nautilus 803, with its larger woofers and greater cabinet volume, might be just the ticket, albeit at a somewhat higher price. Dynamics were well handled under most situations, but I did notice a slight bit of compression in absolute terms. Under most normal music situations this failed to be an issue to me. I was well able to get high SPLs with the Blue Circle BC22 amp in the system. As a matter of fact, I would actually suggest having a listen to this amp drive the Nautilus 804s since there seemed to be a sort of symbiosis going on between the two products. Stick with a solid-state front-end if you lean towards a focused detailed presentation, and add some tubes to the equation if need be. The 804s were compared to my MartinLogan Aerius i speakers, not for so much as what the differences were, but more for what both of these very different products bring to the table. Most would argue that a fairer comparison would be between the (now discontinued) SL3 and the Nautilus 804, and I tend to agree. But because I didnt own the SL3s, I had to make do. The Aeriuses, despite being the less expensive speaker, still offered a unique perspective on the music. They can portray a fine sense of delicacy and airiness (no pun intended) to the midrange, which is the hallmark of a fine electrostatic design. The Aerius has always excelled at small-scale music, solo voice, chamber music, jazz ensemble. It still does. There is no arguing that the baby Logan was designed to satisfy music lovers with small rooms, and perhaps more distinct music preferences. Partnered with the Krell KSA-200S, however, I dont think that I have ever heard a pair of Aeriuses sound quite so, ahem, full range. The Krell certainly mitigates some of the areas where this speaker is perceived as weak. The Nautilus 804s, on the other hand, are far more capable in terms of presenting the dynamic portrait of a broader range of music. They just seem more comfortable handling a larger variety of musical formats. They are also far more articulate and defined in the lower registers, which has always been a weak point for the Aeriuses. The midrange on both speakers is superb; however, I did find the Nautilus 804s more revealing on some music. Imaging is largely a judgment call. If you prefer a LARGE presentation, then the Aeriuses will be your cup of java; however, if you prefer more focus, and specificity, then your needs will be met more by the Nautilus 804s. This is not to say that the 804s sound small; they don't. They just dont have the pervasive bloom that most panel speakers exhibit. Hence I felt like I was more in touch with the perspective presented by the Nautili. Treble presentation is more finely detailed over the Nautilus 804s, the Aeriuses sounding perhaps a bit rolled off or rounded by comparison. Both are excellent speakers; however, the 804s seem to fit the bill as being more flexible in terms of what they can do with a larger variety of music. Its interesting to note that the physical footprint for both speakers is very similar, yet the 804, by virtue of its shorter height, seems less physically intrusive. I think that the B&W Nautilus 804 is certainly a fine product. It has, for me, set new standards as to what I expect to hear from B&W in the future. The Nautilus 804s offer a composed and refined midrange, seductive highs, and an almost electrostatic-like coherence -- all in a compact enclosure. They can also grow with your system and reveal each change along the way. Like true thoroughbreds, they will exploit what they are given to work with. While the competition is stiff in the $3500 price category, with a number of high-quality speakers available, not many will exhibit the 804's well-voiced sonic mix, great looks, and manageable footprint that makes it ideal in small to medium-sized rooms. In the end, the B&W Nautilus 804 never failed to communicate to me, no matter what I was listening to -- Bach, Bob Marley, or Harry Connick. The essence of the music was always there. Price: $3500 USD per pair.